The purpose of the Boy Scouts of America: Incorporated on Feb. 8, 1910, and chartered by Congress in 1916, is to provide an educational program for boys and young adults to build character, to train in the responsibilities of participating citizenship and to develop personal fitness. Cub Scouts is a year-round family and home-centered program that develops ethical decision-making skills for boys in the first through fifth grade (or who are 7, 8, 9, and 10 years old). Activities emphasize character development, citizenship training and personal fitness. Tiger Cubs is a year-round family and home-centered program that encourages the ethical decision-making skills for first grade (or 7-year-old) boys. These boys participate in the program with their adult partners. The program emphasizes shared leadership, learning about the community and family understanding. Wolf Pups is a year-round family and home-centered program that encourages the ethical decision-making skills for 2nd grade (or 7- 8year-old) boys. These boys participate in the program with their adult partners. The program emphasizes shared leadership, learning about the community and family understanding. Bear Cubs is a year-round family and home-centered program that encourages the ethical decision-making skills for 3nd grade (9year-old) boys. These boys participate in the program with their adult partners. The program emphasizes shared leadership, learning about the community and family understanding. 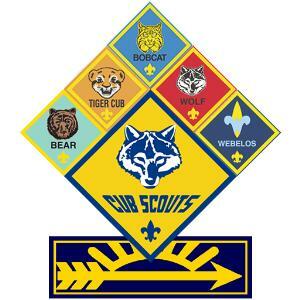 Webelos Scouts is a year-round family and home-centered program that develops ethical decision-making skills for fourth- and fifth-grade (or 10-year-old) boys.These boys participate in the program with their adult partners. The program emphasizes shared leadership, learning about the community and family understanding.